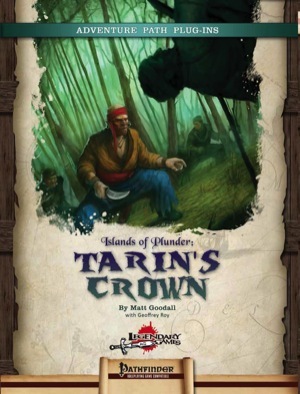 Islands of Plunder: Tarin's Crown is a 28-page adventure for 6th-level PCs fraught with harrowing battles on land and aboard ship, through treacherous terrain against even more treacherous foes. It includes two sets of maps, one for the GM an unkeyed set for players, as well as scaling notes to adjust the difficulty of the adventure for higher or lower-level characters. Tarin's Crown is the first in a series of pirate-themed Islands of Plunder adventures by superstar author Matt Goodall, collaborating on this adventure with Geoffrey Roy, with amazing artwork by Ivan Dixon, Jason Juta, and Nick Russell, and marvelous maps by Pedro Coelho. This adventure can be easily dropped into any seafaring campaign, though it also harmonizes beautifully with the official Pirate Adventure Path from Paizo, Inc. (issues #55 to 60). The Islands of Plunder series continues Legendary Games’ tradition of bringing you outstanding content by the best authors in the business, combined with amazing art and production values and innovative layout design. We hope you enjoy using our products as much as we enjoy making them, and that you’ll keep coming back again and again to Make Your Game Legendary!